Colour temperature is a term used to describe the colour of visible light, however it is not just a posh word for blue light, red light etc. C.T is a reference of the perceived colour of “white” light in lighting and equipment that uses light, like cameras. Colour temperature is measured in Kelvins (K), the physics behind the measurement is a bit involved and doesn’t really matter for now. Light colours in the Kelvin Scale include candlelight (a warm orange) at 1500K to the light from a bright blue sky over 10,000K. A relevant point on the Kelvin scale for stage lighting is 3200K, a tungsten light bulb colour temperature. Another is 6500 Kelvins, a daylight. These colour temperatures are points on a range and not the exact colour of each light bulb or sky. 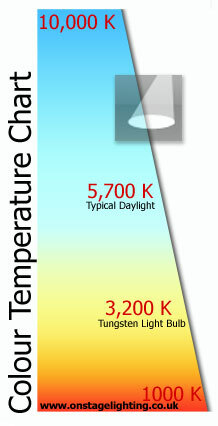 The colour temperature chart shows a range on the Kelvin scale. So, we have light source colour measured on a scale. Why do we need to define light colours in this way? The human eye is capable of changing it’s perception of reflected colour automatically- it does it very well. Equipment that uses light, such as cameras and screens, needs a bit more help and this is done by giving the camera a reference to “pure” white. Modern digital cameras and video equipment can set a “white balance” based on the available lighting but older, more inflexible techniques like photographic film, came ready set. Daylight film and Tungsten film were used to capture the correct colour temperature for the lighting of the shoot. The lighting could also be changed using colour correction gels. So, the colour of the lighting and it’s interaction with the camera are linked. An understanding of colour temperature is an essential part of lighting design if cameras are involved. Colour temperature has a place in stage lighting design, even if you are not working with cameras. The colour of firelight or a bright sunny day is recreated successfully by understanding that “white” light in everyday life has a subtle colour. This light quality can be in art works by the Impressionist painters. Our job in stage lighting design is to convey a sense of location with lighting. We have the tools to change the colour temperature of our lights using colour correction filters such as Tungsten to Daylight (3200K to 5700K) etc. These correction filters block certain colours in the spectrum of a light source to produce a new colour temperature. Knowing that daylight is blue and tungten light orange, it doesn’t take a genius to work out that our Tungsten to Daylight correction filter (such as Lee 201 Full CTB) is a light blue gel. There are no right or wrong answers when it comes to choosing lighting colours but an understanding of different light sources and their colour temperatures are vital. A warm orange glow from a fire or the cool blue of an overcast sky give the audience a visual clue to the surroundings of a scene on stage. The actual colour temperature of a stage lighting bulb filament depends on it’s intensity level. A dimmer set at 10% will make the light more orange than at 100% brightness. When choosing colour correction filters, it might be helpful to consider what levels the lighting will be set to during your show. Great post! I’ve always been confused by the kelvin numbers and what they actually mean. We are a band that currently uses washes to light our stage. We use 2 units that contain 4 500w halogen bulbs. We allow them to cross-fade slowly so at no point is there more than 1 bulb (per side) fully on. However we wish to change to a LED system that runs cooler, uses less power and is more reliable. However it is a mine field out there. No units tell you the luminosity , just power consumption. There are units that use many 1mm LEDs, some with less 1w LEDs and some with only a few 3w LEDs. The price varies dramatically too. Is there a way you can tell how bright these units are? I am a news camera operator by trade, but I have been filming a few concerts of late (mortgage stress…) The colour temp of the LEDs has me gasping. One thing I have noted is the lights are DRAMATICALLY low in light output. A spotlight four metres from the stage was forcing me to work at f2.8 while a tungsten from the bio box would leave me with a happy f8 for depth of field management (easier to keep the stage talent in focus) while the white balance said 10,000 degrees K.
So outrageous, the light was visibly blue. The easiest thing about filming stage gigs lit with tungsten is I can setup a 3200K white balance, and I know the whole show will be fine. With the LEDS, the colour temp does drift… so skin tomes look awfull. Thanks for your comment, Ben. I have a ton of additional information on the current state of play regarding LEDs that I am going to use to update the LED lighting article in the near future. It may go some way to confirming the reasons for your experiences and help others navigate their way around a complex contemporary subject.